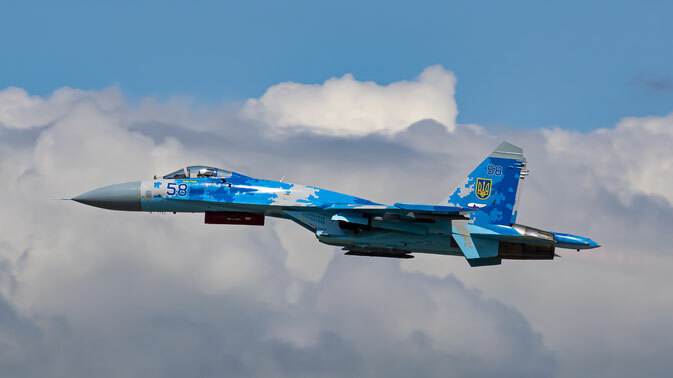 The Danish Airshow was one of the first to announce the participation of the Su-27 from the Ukraine and that was reason enough to book a trip to Skrydstrup together with Robert Jansen. After a quick check-in in the hotel we spend some time at the fence to check the incoming participants on Friday. The Su-27s already arrived earlier that day but we still caught the Polish MiGs and the Swedish Viggen and missed most of the thunderstorms surrounding us. On Saturday a spottersday was organised and with some 200 fellow spotters we were transported by bus onto the airbase. There we were informed that we could participate in tours over the operations part of the airbase and that during the rehearsals we would get a nice spot close to show central. The Ops tour brought us close to the participants and there was plenty of time to make photos of all sides of the aircraft. And as promised we had a perfect spot in the afternoon to photograph the display practices. Conclusion at the end of the day: they know how to organise a spottersday in Denmark. Thank you Jens and Kim! The Sunday had lesser weather. Lots of clouds and a strong wind made it a cold day. But the aircraft action made up for it. Excellent demo's from the Polish MiG-29, the Su-27 from the Ukraine, Belgium F-16 a great display by the Turkish Stars and Patrulla Aguila and an airpower demo by the Danish showing the public how to capture a bad guy (with some excellent driving skills by the way). And of course we need to mention the Fokker Dr.1 flown by Mikael Carlson. It is a joy to see that agile plane fly and the strafing pass with machinegun sound is awesome!